Strong. Dark. Creamy. These are all descriptions of Espresso, the very thick, strongly flavored coffee beverage. Espresso is made by forcing hot water through dark roasted, finely ground, coffee beans. The process presses the water through the ground espresso beans which, in coffee brewing, differentiates Espresso from regular coffee. 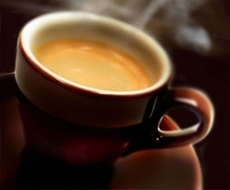 Espresso is noted by the creamy, tan colored froth that floats on the top of the drink, called crema. Espresso is thick, it is concentrated coffee flavor and generally served in small quantities or used as a base for another drink such as lattes, cappuccinos or mochas. Espresso, generally, comes from the specific coffee bean called Coffee Arabica. More commonly known as arabica, and sometimes called the similar Robusta is the specific type of coffee bean used in Espresso Coffee Makers. Arabica type coffee beans are more difficult to grow than regular coffee beans are. This increases the cost of the bean. In turn, you have more than likely noticed, Espresso is more expensive than a regular blend of coffee. Brewing espresso is a highly skilled craft, an art form if you will. A barista is someone who is considered to be a master at brewing espresso. Delonghi Products carries a complete line of affordable Delonghi Espresso Makers so everyone can be a barista in their own home and brew restaurant quality espresso in their own homes. True Italian afficionados relate espresso brewing and espresso makers to the rule of four M's. Mano for hand, macchina for machine, (espresso machine), macinzaione for grind and miscela for blend. The process defined is to force 195¦F water through the very finely ground espresso beans, which in the espresso machine, are called a puck. The rich, syrupy beverage contains the heavy oils from the coffee beans which are extracted and emulsified through the pressure forcing process. The espresso machine has a steam wand which steamd and froths milk when making latte and or cappuccino.